WASHINGTON –- President Barack Obama will pledge $3 billion this weekend to an international fund that helps developing countries address climate change, in yet another move seen as important to advancing cooperation toward a global climate agreement. The fund, known as the Green Climate Fund, was created four years ago as a way to help poorer countries cut their own greenhouse gas emissions to stem future climate change, as well as adapt to changes that are already happening. The announcement is expected to come at this weekend's G-20 meeting in Australia, a senior administration official told The New York Times on Friday. While aid organizations were hoping for a higher commitment from the U.S., they said the announcement was crucial to advancing negotiations on a climate deal. "It's going to be an important step that the U.S. is announcing," said Heather Coleman, climate change policy manager at Oxfam America. Coleman added that Oxfam had hoped for a larger amount of money -- closer to $4.8 billion -- but said it was still critical that the U.S. offered a pledge. Other countries, including France, Germany, Sweden, the Netherlands, Mexico and South Korea, have already announced pledges to the fund, bringing the total amount committed, including the U.S.' contribution, to $6 billion. At a United Nations summit on climate change in September, some leaders of developing countries expressed frustration at the time it was taking the U.S. and other developed countries to offer their pledges to the fund. Other developed nations, such as the United Kingdom, Canada, Japan and Australia, still have not offered pledges. 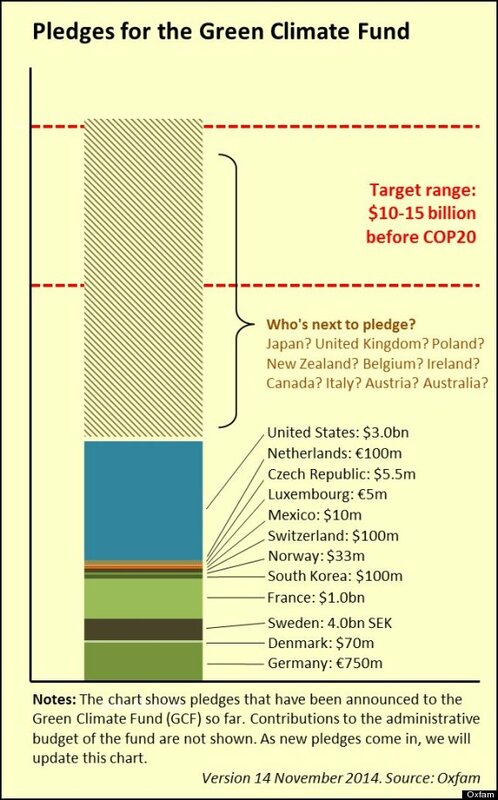 The countries party to the United Nations Framework Convention on Climate Change had set an original target of getting $10-15 billion pledged to the fund before the next negotiating meeting in Lima this December. Of course, Congress will still have to actually appropriate at least some of the U.S. funds, which may prove difficult with a Republican-controlled House and Senate. "I still think it's going to be a fight -- and that applies across the board to international climate finance and foreign aid in general," said Coleman. The Green Climate Fund pledge comes just days after Obama and Chinese President Xi Jinping announced a bilateral agreement to address climate change. “This week has breathed new life into global climate action," said Andrew Steer, president of the World Resources Institute, in a statement Friday. "Building on the landmark U.S.-China climate agreement, this pledge signifies that the U.S. is serious about delivering a global climate agreement."